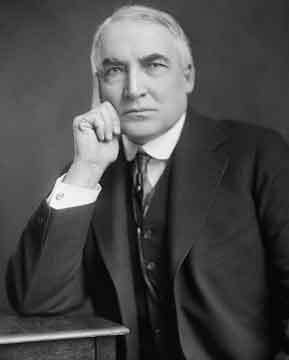 Warren Harding was born in a farmhouse in Corsica, Ohio. Throughout his childhood Harding performed farm chores at home. He was first taught at home by his mother. He received formal education at a one-room schoolhouse. At the age of 15, Harding entered Ohio Central College. In 1882 he graduated with a B.S., and gave the commencement address. For one term after graduating from college, Harding taught school. He then briefly sold insurance. In 1884, with two partners, Harding purchased the Marion Star newspaper. He soon acquired full ownership of the paper. In 1889 Harding successfully ran for Ohio State Senator. He served as Republican in the State Senate until 1903 when he became Lieutenant Governor of Ohio. He served as Lieutenant Governor until 1905. In 1910 he tried to oust the incumbent Democratic Governor but was unsuccessful. In 1914 Harding was elected to the U.S. Senate, where he served until 1921. Harding had a very undistinguished career in the Senate. He had one of the worse attendance records and his boldest effort in the Senate was his strong opposition to the League of Nations that he called: "a supergovernment of the nations which enter it or it will prove the colossal disappointment of that ages."